London has many well-known attractions but there are few tourists who venture beyond the beaten path. Oh, what a shame! Those who stay in the historic centre can see magnificent parks, but if you go west, then there's a green environment waiting for you ... We're talking about Little Venice! Little Venice is a green space located in the west of London, in the Maida Vale district. When you visit this place, you will feel like you are leaving London. Here there are no strict facades but pretty barges waiting patiently over the waters of the Regent's Canal. In this real little green paradise, you will be able to enjoy the calm ambience of the district. Some will say that the place has nothing to do with Venice, but the presence of the barges on the canals are certainly unique in England. Created by the junction of Regent's Canal and Grand Union Canal, Little Venice is the ideal place for walks. Along the tops are cafes and restaurants where you can eat well and cheaply! The water is crossed here and there by pretty little bridges that give a romantic dimension to the area, especially as it is possible to eat aboard a barge. As you walk along the canal, you can enjoy the peacefulness of it, with the white facades of the houses bordered by tall trees. You will, therefore, discover a really different city inside of London with small shops, restaurants, cinemas etc. Everything is made to seduce us, especially since the place has its own tube station! 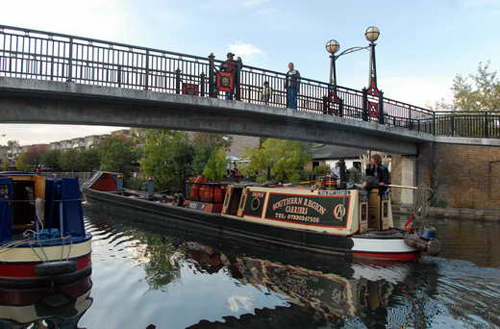 If you wish, it is possible to go to Camden Town by boat, which will include a return walk of about forty minutes. Once there, you will be able to enjoy the shops and the market of Camden! Little Venice is in West London, in a quiet residential area. You can get off at Paddington station and then it will take you about 15 minutes to reach this paradise.